A village situated on the terraces of a gentle slope in a sunny valley, full of colours, tastes, but also strong bonds: this place is Sordevolo with its people. 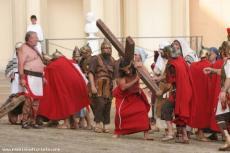 In the soul of these people, since long ago, is hidden a sort of sickness called “Passion of Christ”. An extraordinary event that involves and, in a certain way, “contaminates” the generations that lived or live now here. Everyone, inside the amphitheatre, surrounded by the natural background of mountains and green hills, becomes living protagonist of that occurence that has left a sign on humanity. During the XIX century, among the great number of events the newspapers spoke about, the local news before and the regional ones later mentioned a sacred play, soon known as “Passione di Sordevolo”. Costantino Nigra and Delfino Orsi, both well known experts of XIX century, speak of it enthusiastically and Prof. Alessandro D’Ancona, member of the University in Pisa, dedicated a broad paragraph to the in his prestigious work entitled “Origini del Teatro Italiano”. Sordevolo, a place of sacred plays, finds nowadays its best expression in the Passion of Christ while in the past it was found with them performance of the Last Judgement and in the St-Augustine Drama. When we speak of “Passione di Sordevolo” what are we talking about? 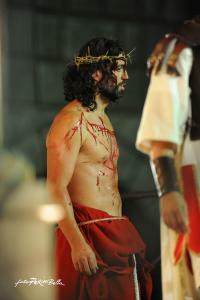 Certainly it is the greatest people’s play in Italy, performed by a multitude of young and not so young amateur-actors who work and prepare themselves with extreme seriousness and dedication, to play the story of the last hours of Christ. 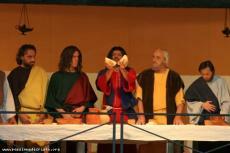 The staging of the Passion, handed down with no interruption from a generation to the next one, guarantees the surviving of a by-now rare, really and completely popular form of theatre, a tradition that in Sordevolo is also cultivated through the education of children and the “Passione dei Bambini” (Children’s Passion), realized in the same period and entirely performed by themselves. 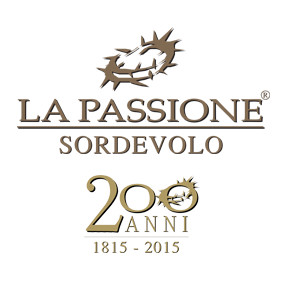 Nobody knows when the Passion was played the first time, but the historian Delfino Orsi confirmed the representation took place for sure on the years: 1850-1860-1865-1871-1876-1881-1891. Later it was played on 1897-1901-1904-1914-1924-1934. Called off during the II° World War, it was resumed on 1950-1960-1970-1975-1980-1985-1992-2000- 2005-2010-2015. The organization is demanding and elaborate; for a certainty we know that on 1850 the first Committee was formed, whose task was the preparation of the play as a real performance to be realized every 5 or 10 years. Since then, each cycle of plays is handled by an organizing Committee. We underline both the deeply free nature of this original local culture and the commitment it kindles in the modern heirs of this tradition, in accordance to which every aspect of the staging is processed with the local techniques and human resources only. So it is for the general organisation, such as the making of all scene- sets and costumes, for the scenery project, for the direction, the drama school, the stage setting. 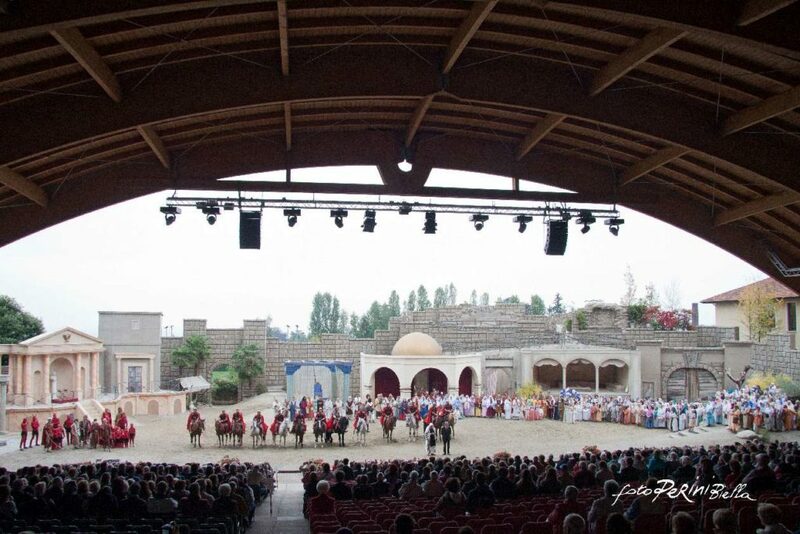 The performances take place in a wide open air area where a bit of Jerusalem during the year 33 is rebuilt : Herod’s palace, Sanhedrin, Pilate’s Praetorium, Mount of Gethsemane, the Last Supper room, Mount Calvary. The play is composed by a prologue and 25 scenes with a total of about 400 actors and walking people working. The text our Passion is based on, dates back the last years of the XV century; it’s a work in verses elaborated by Giuliano Dati from Florence, Chaplain of the ‘Chiesa dei Santi Martiri in Trastevere’ ( Rome). This “roman” text arrived up to Sordevolo in an unknown way. In accordance with some assumptions, it seems the original script got up to Piedmont either by means of the relations the Brotherhood St. Lucy in Sordevolo had , as direct affiliated, with the Confraternita (Brotherhood) del Gonfalone in Rome, or through the trade contacts the local family Ambrosetti had with some roman clients. To be honest, Giuliano Dati had only reworked some older texts already kept, in those years, in the archives of the aforesaid Brotherhood. These works go back to the ancient Umbrian and roman lauds-books of the IVX century, period during the which, thanks to St. Francis and other writers, such works, considered the foundation of Italian literature, were born. Various studies about this argument, made by Vincenzo de Bartholomaeis and by Vatasso, confirm this origin through the analysis of the metric structure of six-line and octave rimes. However several philologists, such as D’Ancona and Toschi, mention the Passione di Sordevolo as an example of popular theatre, based on scripts dating back the lauds-books age. Therefore this Passion has an inestimable value not only as popular theatre, but also as witness to the continuity of an age-long literary tradition arrived here from the capital. The text is religious, while the organization is secular. The characters are evangelic, viewed in a historical context, but the performance is human spontaneity. The text is literary, the interpretation is realistic. Marco Neiretti, former mayor of Sordevolo, wrote: “ Against all what can be supposed the institutionalization of the Passione di Sordevolo revives the tradition instead of to fossilize it; the identification of people with the show is always deeper and, due to a decline of other community values, this tradition becomes –Art of all people, of all the Community-“. “the general and the single perfection, intensity and religiousness reached by the performers bring this sacred drama to its origin; and, together with the powerful delicacy of expression, the play seems to be fruit of a great spiritual, intellectual and technical experience”. “Arrived here with a bit of scepticism to watch a popular play, we’ve been won as a child by the fine and natural mass movements, by the accuracy and polychrome of costumes, by the dignity of stern scenes; and we are no longer paying member of an audience, nor folklore experts, nor theatre fans. We are naked beings, alone with pour trouble, our eyes turned to the repetition of a fact that seems to be the sole acceptable answer to our existential questions. A whole village has lived a great experience, with dignity and without any wild paroxysm, in the shy way the Biellese people can do. The sacred plays belong so close to the community life that the net proceeding always go to a charitable institution. This tradition has been respected by all Committees and it proves how the play is an event that goes beyond the theatre moment to become an economic and social commitment felt by all the village. The following with solidarity, enthusiasm and devotion this tradition is a duty of the people of Sordevolo, aware of their being able to emerge in the cultural field of the sacred performances in Italy and abroad. Every effort made has no direct value in the everyday life but in the near future; it’s a continuation of a work born several century ago and it’ll be an example for the next generations. The community of Sordevolo, with renewed spirit of cooperation, has already begun the preparation of the Passione 2020: a work of people that will again bring to life, with gestures and words, an historical event that shook mankind and nowadays still lives in Sordevolo and one more time the words written by a local journalist, Giovanni Orso, “as primroses under snow”, will come true.